SRS components are located in this area. 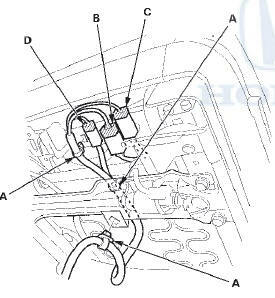 Review the SRS component locations, 2-door (see page 24-23), 4-door (see page 24-21) and the precautions and procedures (see page 24-25) before doing repairs or service. 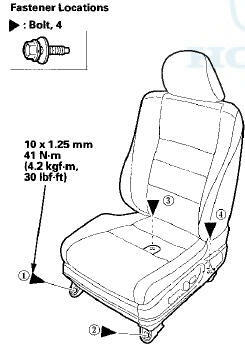 Do the ODS unit initialization (see page 24-40), after front passenger's seat replacement. NOTE: - Put on gloves to protect your hands. - Take care not to scratch the body or tear the seat - Use the appropriate tool from the KTC trim tool set to avoid damage when removing components. 1. Adjust the steering column to the full tilt up position, and to the full telescopic in position. Adjust the seat-back recline to a middle position. 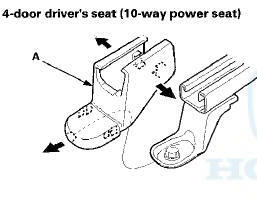 2.2-door passenger's seat: Carefully insert the tip of a small screwdriver (A) through the hole in the back of the front seat belt lower anchor cover (B), and into the hole in the front seat belt lower anchor (C). Unlock the lower anchor by pushing in on the screwdriver. Remove the screwdriver, and then detach the front seat belt anchor plate (D) and the anchor cover from the lower anchor. 3.4-door: Slide the front seat all the way forward. Carefully pry up on the bottom of the anchor cover (A) at the pry point (B) with the appropriate trim tool to release the hooks (C) and the tab (D), then remove the cover by pulling it upward. 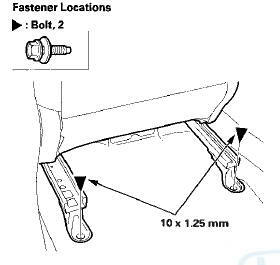 4.4-door: Remove the lower anchor bolt (A). 5. Remove the seat track end covers (A) from the back of both seat tracks. 6. 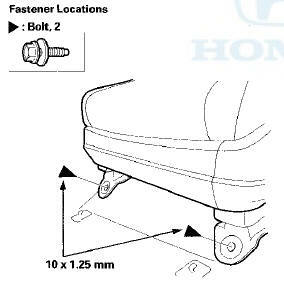 Remove the seat mounting bolts from the rear side of the front seat. 7. Slide the front seat all the way back, and remove the seat mounting bolts. 8. Do the battery terminal disconnection procedure (see page 22-91), then wait at least 3 minutes before removing the seat. 9. Lift up the front seat, then detach the harness clips (A). 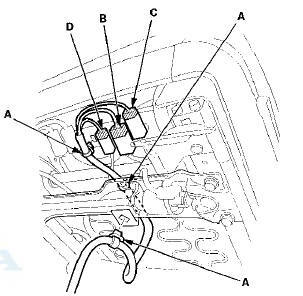 Disconnect the floor wire harness connector (B) (except driver's seat (manual height adjustable seat)), the side airbag connector (C), and the seat belt buckle switch connector (D). Driver's seat (manual height adjustable seat): Disconnect the seat position sensor connector ( E ). 10. Remove the head restraint 11. With the help of an assistant, carefully remove the front seat through the front door opening. 12. Install the front seat in the reverse order of removal, and note these items: - If the clip are damaged or stress-whitened, replace them with new ones. - Push the clips and the hooks into place securely. - Tighten the bolts by hand first, then tighten them to specified torque. the passenger's seat is similar. - Make sure each connector is plugged in properly. - Do the battery terminal reconnection procedure (see page 22-91). - The triangle marks (A) on the anchor plate (B) and the lower anchor (C) must face the same side. Insert the anchor plate into the lower anchor, and make sure that it is locked securely.